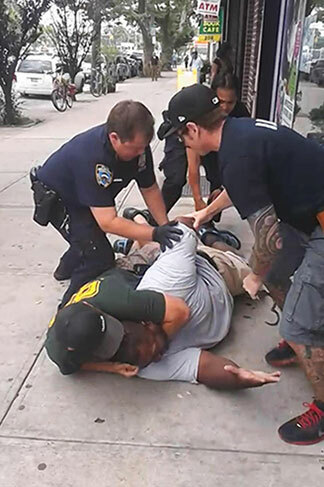 On December 3 a Staten Island grand jury announced that no charges would be filed against the NYPD cop who chokeholded Eric Garner to death in late July. Several thousand furious protesters took to the streets of New York to protest this horror, and more in cities around the country. There was a symbolic “die-in” at Grand Central terminal, crawling with police. Over and over protesters chanted Eric’s last words, “I can’t breathe.” And also, “Hands up, don’t shoot!” referring to the racist police murder of Michael Brown in Ferguson, Missouri in early August. “Black lives matter” was another chant, a searing indictment of racist America, where black people were brought in chains as property to make others rich, where property is still all that matters – and will be until we make a revolution. The next night, even the New York police said 10,000 were marching for hours, disrupting traffic throughout Lower and Midtown Manhattan and downtown Brooklyn, blocking bridges, tunnels and highways. TV news commentators said they had never seen anything like it. And everywhere, demonstrators were greeted by blocked motorists honking their horns in support to the rhythm of the chants. But the police were undeterred, arresting 100 people the first night, over 200 the next, and more on December 5 as demonstrators took the anger to Macy’s and the Apple Store. 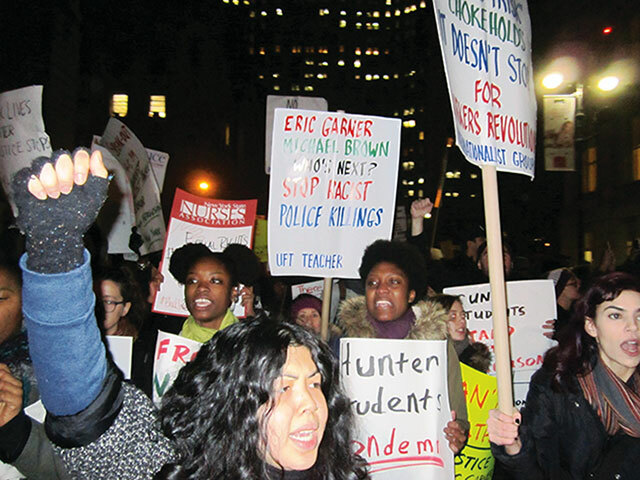 The CUNY Internationalist Clubs joined in the protests from the first hour, gathering in Union Square, marching to Rockefeller Center, then to the West Side Highway. On December 4, we held a speak-out in the plaza at Hunter College which drew 200, with powerful and moving contributions by many who had never given a speech before. We headed downtown with a contingent of several dozen African American, Latino, Asian and white students to Foley Square, and then back into the streets. “Eric Garner, Michael Brown – Shut the whole system down!” we chanted, and “Only revolution can bring justice!” Hundreds of marchers picked up our chants. Coming on the heels of the Ferguson decision letting off the murderer of Michael Brown, the fact that killer cop Daniel Pantaleo walked drove home that the entire legal system is stacked against black people. As our signs said, “No Justice in the Capitalist Courts.” And the fact that the murder of Eric Garner was caught on video and still the murderers got off exposes all the phony talk by NYC Democratic mayor de Blasio and Democratic president Obama about “retraining” police and putting body cameras on cops (which they can turn off at any time). The chokehold cop (who has made hundreds of “collars” under NYPD commissioner Bratton’s policy of massive arrests for minor “crimes”) isn’t the only guilty one. Add the cops who piled on top of Garner, pushing his face into the sidewalk and crushing his chest so he couldn’t breath; the EMS technicians who didn’t try to save him, and the prosecutor who let Pantaleo off and granted the rest immunity. They all belong behind bars – but it won’t happen, because the bourgeois ruling class backs its snarling, racist guard dogs to the hilt, whether in blue uniforms, plainclothes or suits and ties. Police killing of African Americans doesn’t stop. Three days after the Garner decision they buried Akai Gurley, shot in the stairwell of a Brooklyn housing project by a rookie cop who didn’t report the incident as Akai lay dying and instead texted the PBA (Patrolmen’s Benevolent Association, i.e., the cop protection racket) rep for advice. In Cleveland, 12-year-old Tamir Rice was shot to death on a playground by a white cop dismissed from his last job for using firearms dangerously. And in Phoenix, a cop chased Rumain Brisbon into his home as he was bringing dinner from McDonald’s, and shot him in front of women and kids. Now various empty “reform” proposals are being floated, like appointing special prosecutors when police are investigated. Cops and prosecutors are all part of the same “team,” and they run the grand juries. The courts are just as much part of this apparatus of repression. Walk into any courthouse, through the metal detectors, past the intimidating gun-toting police lining the halls, into a courtroom and watch how they process defendants like a factory assembly line. A special prosecutor would be just another cog in this well-greased machinery of injustice. Some protesters yell at the police, “you serve us.” Like hell they do. Anyone who says the police are potential allies, “part of the 99%” or “fellow workers” is spreading deadly dangerous illusions. The cops are the first line of defense for the exploiters and oppressors. Who do CUNY administrators call to suppress us when we protest their attacks on student rights, or war criminals like David Petraeus? The NYPD. The one-two punch of racist injustice, from Ferguson to NYC, should drive home that basic truth about the forces of repression. 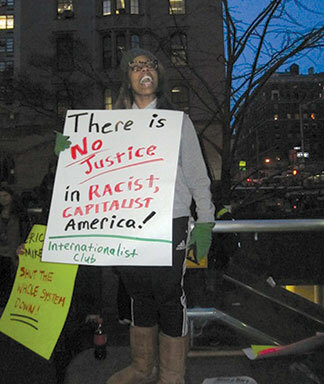 It’s Marxism 101, shown on the streets of New York. To do away with racist police terror for good, we must kick out the racist ruling class that the police “serve and protect.” This is what Marx and Lenin meant by the capitalist state. And it will take a revolution, a workers revolution championing all the exploited and oppressed, to bring it down, to sweep away the cops, courts and capitalist politicians and replace the dictatorship of capital with the rule of the working people who produce all the wealth.